The Gryphon Football team is a family unlike any other. I was welcomed into this family in August when I began my co-op job training. Initially, when I started this co-op work term, I didn’t know anything about football. With each home game, I learned more concepts and became more interested in the sport and more amazed by the Gryphons football team. As part of my job, I work on tasks during the home games which means that I miss some of the plays. Recently, I got the opportunity to attend an away game and even better, I watched the game from the sidelines. The away game trip began with a 6-hour bus ride to our capital city. The excitement and nerves were very real as we travelled; players and coaches alike going over their plays. Next was an amazing dinner in our hotel, the Marriott. Aside from the delicious food, I love going to the pre-game dinners because the players and coaches truly are motivational. Before every game, a senior player gives a speech to the rest of the team about their experience as a Gryphon Football player. This week Riley Baines told us about his struggles with balancing academics and varsity athletics. As he spoke, there were many nods around the room. These young men understand each other in a way that few others do. From playing on the field together to classes and studying together, they have a lot to tackle. The following morning consisted of carbing up before our game against the Carleton Ravens at MNP Park. We were on a winning streak after defeating the Laurier Golden Hawks and Waterloo Warriors and we were not about to have our streak broken. Right after breakfast, we loaded the bus and drove to the Ice House where our Gryphons would prepare for the game. While they were getting their limbs frozen and taped, I made half of the Gatorade (about 25 liters) in preparation for our game. The taping process is a pretty interesting one that I hadn’t gotten a chance to see during our home games. 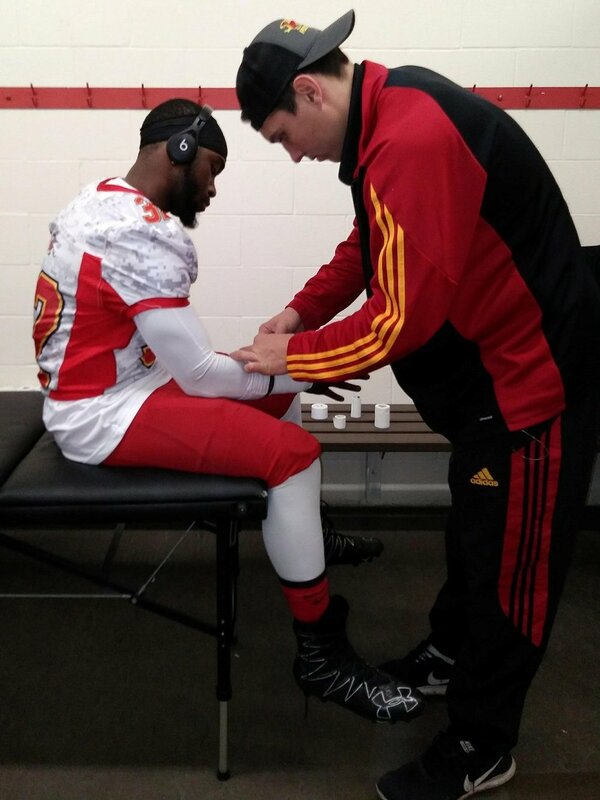 It was fascinating to see just how prepared the Gryphon Football athletic therapists were, they were ready and able to tackle any challenges the boys threw at them. On a side note, even a couple of the OUA referees came to be taped by our athletic therapists, that’s just how good we are. 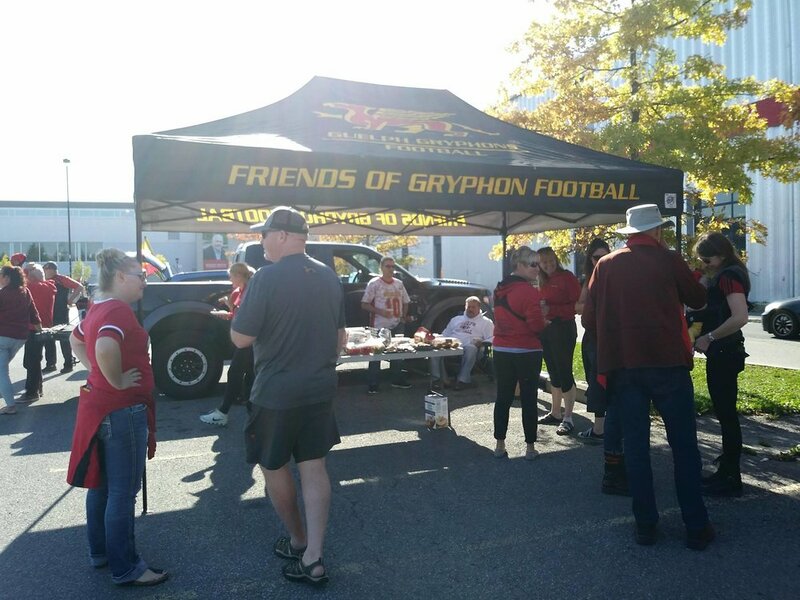 Before the game started, while the Gryphons warmed up, I visited the Parents of Players (POP) tent in the Ravens stadium parking lot. Interacting with the POP group is always enjoyable because they’re approachable and very willing to do anything to help their boys. Some have travelled half-way across the country to see their son play which is very admirable. For those who cannot make it, the POP are very willing to take in any Gryphon football player as their own. During Thanksgiving, the POP took in players who could not travel all the way home. That’s only one example of some of the wonderful work they do. Watching a Gryphon game from the sidelines is really unlike any other event. The Gryphons are an extremely supportive team which is one of the reasons I thoroughly enjoy working with them. Throughout the game, these young men were the embodiment of working hard and persevering through adversity to overcome obstacles. They encouraged each other throughout, never giving up, even when the Ravens had a 10-point lead over us. In the final quarter, the Gryphons pulled through and with just 5 minutes left in the game, we took the lead and guaranteed our spot in the Quarter-Finals. It reminded me of a similar miracle we had during the Waterloo game where we changed the game in the last 2 minutes by scoring 7 points, giving us the win. The other component of this great team are the coaching staff, as the Gryphon coaches are exceptional. They’re very friendly, welcoming and very devoted to their team. I witnessed this firsthand when I spoke with Mike MacDonald, the Offensive Line Coach. He told me about becoming a room donor at the new Pavilion because it was very important to him to impress upon the boys how important being a family is. During the game, every coach was trying their best to fire up the team and inspire them to play their best game. Even when we were losing and I personally felt a little disheartened, the Gryphons never stopped giving 110% to their team. If anything, those points that the Ravens had over us made the team more determined to succeed. These Gryphons definitely are team first! Leaving Ottawa was bittersweet. On one hand, I was very proud of the team for making it to the Quarter-Finals and beating the Ravens. On the other hand, I was sad because our trip was over and the strong sense of comradery that comes with being a Gryphon is a rare commodity.